Tuvalu, a Polynesian Island Nation consisting of four reef islands and five true atolls, located in the Pacific Ocean midway between Hawaii and Australia has a total land area of 10 square miles and a population of around 10,500.Tuvalu is among the least populated countries of the world. The country is very concerned about global warming as its low maximum elevation makes it vulnerable to rising sea levels. Its soil is not fit for cultivation and drinking water is always in short supply. The sectors of its economy are fishing, farming, sale of fishing licenses, sale of postage stamps and coins, and worker remittances. Its remote location does not make tourism feasible. The Tuval Trust Fund, ‘900’ area code leasing and its ‘.tv’ internet name are sources of revenue. The best time to visit Tuvalu is either in Dec/Jan or June through September. Tuvalu offers its visitors a chance to unwind and appreciate nature. Snorkeling is rewarding as the Funafuti Lagoon is teeming with multi-colored tropical fish. It has some historic wartime sites, as it was a base during the Second World War. Traditional food of Tuvalu includes pulaka (similar to taro), seafood, bananas, breadfruit, coconut, and pork. Where The Hell Is Tuvalu? By Philip Ells 978-0753511305 $12 An inspiring story for anyone dreaming of leaving the rat-race behind. The author is a UK attorney who lives in London. He lived in Tuvalu and was the ‘People’s Lawyer’ there. The first stamps of Tuvalu were a set of fifteen stamps released on January 1, 1976 that were ‘Tuvalu’ overprints on Gilbert and Ellice Islands issues from 1971 showing local scenes. The set (Scott #1 to #15) catalogs for around $35 MNH and around $20 used. The designs show harvesting copra, women cleaning Pandanus leaves, fisherman casting nets, canoes, dehusking coconuts, woman weaving Pandanus fronds, basket weaving, tiger shark, beating rolled pandanus leaf, loading copra, night fishing, local handicraft, woman weaving coconut screen, and Coat of Arms. Tuvalu released a set of fifteen stamps later that year showing Map of Islands and local scenes. The set (Scott #23 to #37) is sought after and catalogs for around $65 MNH and around $20 used. The designs show Map of Niulakita and leathery turtle, Map of Nukulaelae and sleeping mat, map of Nui and Talo vegetable, Map of Nanumanga and grass dancing skirt, Map of Nukufetau and coconut crab, Map of Funafuti and banana tree, map of Tuvalu Islands, map of Niutao and flyingfish, map of Vaitupu and Maneapa, map of Nanumea and Palu fish hook, canoe pole fishing, reef fishing by Flare, House, and Colony Ship M.V. Nivanga. The Islands previously known as Ellice Islands were administered as a protectorate by Great Britain from 1892 to 1916 and then as part of the Gilbert and Ellice Islands Colony till 1974. It gained independence as Tuvalu in 1978 and the Gilbert Islands became independent as Kiribati. Government income in the islands comes mainly from the sale of stamps and coins, fishing licenses, worker remittances, and foreign aid. A long set of sixteen stamps released between 1983 and 1984 showing Handicrafts. The set (Scott #183 to #195) catalogs for around $15 MNH and around the same for used. The designs show fisherman’s hat, lures, and hooks, Cowrie shell handbags, wedding and baby food baskets, canoe model, women’s sun Hats, climbing rope, Pandanus baskets, tray and coconut stands, Pandanus pillows and shell necklaces, round baskets and fans, reef sandals and fish trap, rat trap, waterproof boxes, pump drill, fisherman’s hat and cnoe bailers, and fishing rod, lures, and scoop nets. 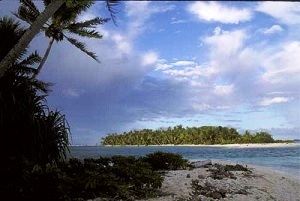 Tuvalu has almost no natural resources. Handicrafts along with other small scale industries do exist. Tuvalu is just 4.5 meters above sea level at its highest point which is the second-lowest of any country (Maldives is the first). Any future rise in sea levels will threaten the islands. A set of six stamps released in 1990 showing World War II Ships. The set (Scott #543 to #548) catalogs for around $15 MNH or used. The designs show Japanese Merchant Conversion of 1940, USS Unimak of 1944, Amagari – Japanese Hubuki Class of 1942, AO-24 USS Platte of 1943, Japanese Sumushu, and CV-22 USS Independence. Thousands of Allied marines were stationed in Tuvalu during World War II when it was used as an operations base. A set of twelve stamps released on March 15, 1997 showing Fish. The set (Scott #720 to #740) catalogs for around $15 MNH or used. The designs show bluetail mullet, Queen fish leatherskin, paddletail, long-nose emperor, long-snouted unicornfish, Brigham’s snapper, red bass, red jobfish, leopard flounder, red snapper, longtail snapper, and black trevally. A set of four stamps and a souvenir sheet released on May 17, 2004 to mark the Fight against HIV and AIDS. The set (Scott #948 to #951 and #952) catalogs for around $12 MNH and around the same for used. The designs show speaker at conference, speaker and dais, people standing in front of banner, people seated at dais, and conference participants. The first coins of Tuvalu were Parliamentary Democracy Standard Coinage (100 Cents = 1 Dollar) Bronze Cents issued in 1976. The first issues had high mintage and catalogs for well under a dollar for BU. The first gold coins were 0.4710 troy ounce 50 Dollars Gold Proofs in low mintage (2074) issued the same year. It catalogs for a slight premium over bullion value. Tuvalu has issued a number of commemorative proofs over the years for the numismatic market. Tuvalu uses the Australian Dollar as its official currency. Coins $10 and up Commemorative UNC coins from the 1980s starts around $10. Commemorative Silver Proofs starts around $50. Gold Proofs, Low Mintage Commemorative Silver Proof Sets, etc go well into the 100s. Locally made baskets, bags, mats, hats, and canoes are excellent reminders from this country. Miscellaneous Collectibles $3 and up Flags, Lapel Pins, Key Chains etc start around $3. Gold on Silver themed necklaces start around $50.